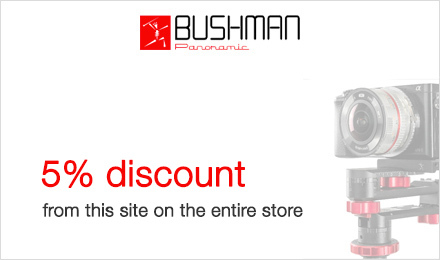 In this second subsection dedicated to photo equipment necessary to the realization of stitched panoramas and more accurately to photo tripods, we will review very useful equipment to easily level your panoramic head: a leveling base, independent or built-in the photo tripod. While we could pass on setting the camera at the ideal rotation point to save some time - or else - it is compulsory that the camera remains completely horizontal during the rotation. The rotary axis must be completely plane or the stitched image will give the impression of bending on the right or the left. 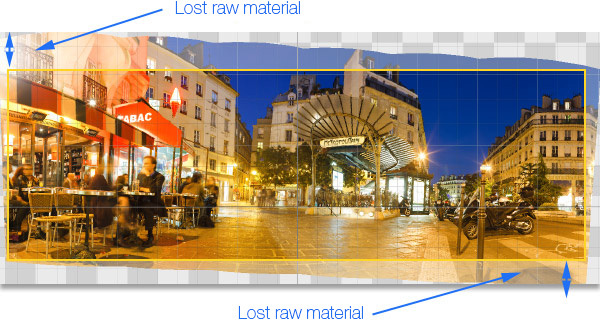 To avoid that, we'll have to reframe it and thus to whittle down the height of the final picture. The effective zone will then be dramatically reduced in height if you don't take leveling into account. It will be smaller in pixels. A simple bubble level can do the trick but one as exists one the base ref. 338 Manfrotto or on numerous tripods is ideal. Some double-bubble levels can even be set in the hotshoe of the camera. Very useful... but always very accurate! Here are two classic bubble levels in photography. 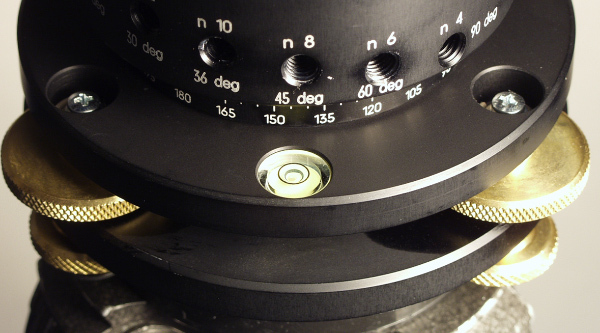 The first one is directly built-in the photo equipment hence is the base or directly in the head. The second one can always be in your pocket and is thus very pleasant to use. You put it in the hotshoe or directly at the base of the head and it does the trick! I prefer this second solution, more accurate. 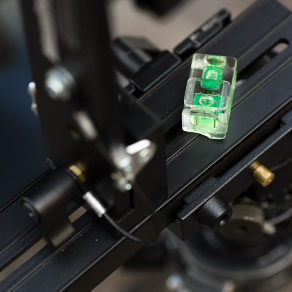 If, round, double or triple-axis bubble level in hand, you want to level your head or panoramic head, using a very handy accessory to quickly level all of this perfectly can prove very useful, a leveling base. 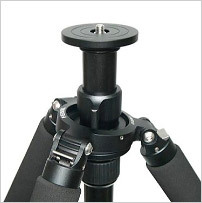 The accessory added between the panoramic head or the photo head and its tripod. Two principles exist: either two stages are linked up with three pulling/drawing screws at 180° hence under the form of a video bowl. Or it's the central column that directly integrates a base or it can quite simply be tilted. Tip! Finding a solution to level your notched head quickly is almost essential. Whether you're using a tiltable column or a leveling base, you will never regret considering the time you'll save. Essential! 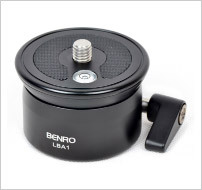 These are accessories that can be added between the tripod and the panoramic head in order to level it easily. Two main principles: either two stages linked up with three pulling/drawing screws at 180°, either in the form of a video bowl. However, it's bulky - 12 cm wide - and still quite heavy - 600 grs. and quick to set up. Very good product, not expensive but very well manufactured! 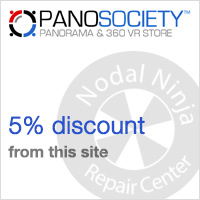 This quick leveling stage is the logical partner of rather light panoramic heads that are the Nodal Ninja. 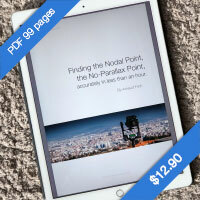 With low bulkiness and for only 200 grs it is possible to level your panoramic head very quickly and easily. 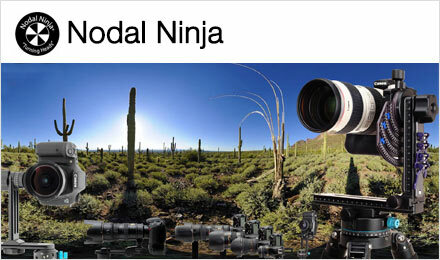 For a light head like the Nodal Ninja 3, it's perfect. 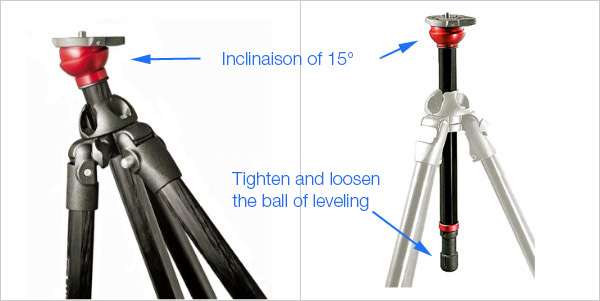 These central columns, adaptable on almost the whole range of Manfrotto tripods (two references for the two categories of Manfrotto tripods) has the characteristic to possess a leveling half-ball on its top that can be tilted as well as a bubble level. By loosening the screw at the base of the column, which, by the way, isn't necessarily very convenient, we can tilt the head or the panoramic head screwed above up to 15%. 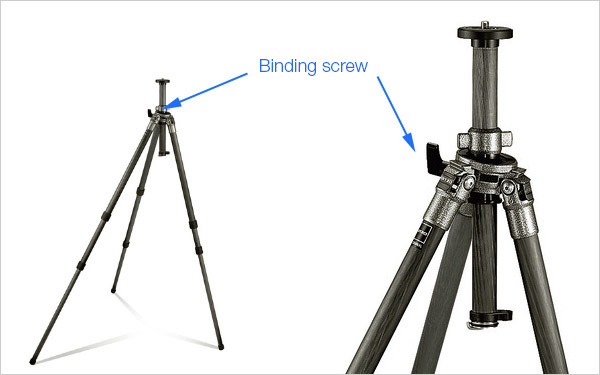 Thanks to a clamping screw on the side or under the tripod, it is possible to tilt the central column at 10/15°. 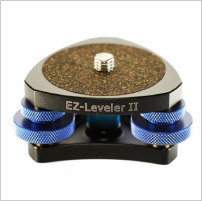 The leveling is very quick, without adding weight to the tripod! I like this solution in the field. 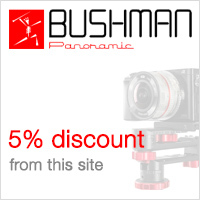 Feisol manufactures very nice carbon tripods, very light and yet stable and this one possesses, moreover, what I find most convenient to quickly level a panoramic head: a central column that tilts to more or less 10°, as the famous Leveling Gitzo... 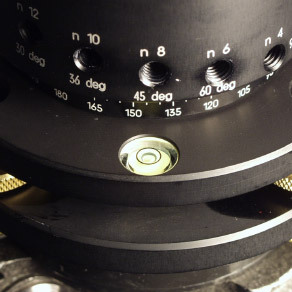 But unlike Gitzo, Feisol offers a tripod that would be equivalent to a serial 3. 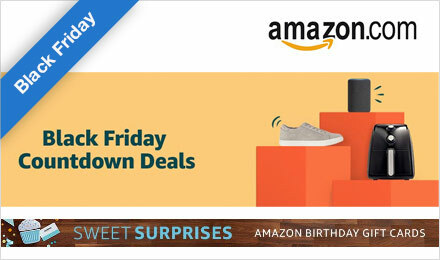 A really great product I highly recommend! 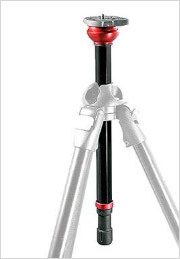 Gitzo has among its range of carbon tripods - hence unfortunately expensive! 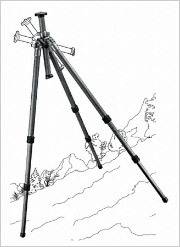 - two tripods which central column can be tilted entirely unlike the Manfrotto one which only has a tiltable ball. It's more convenient because the clamping screw is much more accessible. I love those tripods which qualities I pray everyday!